Microfibers have become more and more noticeable in the news, as they are discovered more and more in our water. This fall they have found the first evidence that microfibers have made their way up the food chain from water to fish to seals. The spreading of microfibers is why GFX advocate campaigns like #whatsinmywash by Hubbub and supported by House of Fraser. The campaign’s goal is to raise awareness of how much our (mostly) polyester and plastic wardrobe contributes to the microfiber problem. With an estimated one third of all microplastics in our oceans[iii] coming from washing textiles, environmental charity Hubbub’s #WhatsInyMyWash campaign encourages consumers to make some simple changes to reduce the number of microfibres being released from their clothes when they’re washed. The campaign, which is proudly supported by House of Fraser, was launched as Hubbub’s research of over 2,000 people across the UK revealed a lack of awareness about the plastic microfibres that come from clothing and the issues they cause. 44% of those polled were completely unaware that microfibres often end up in our food - from mussels to table salt. Half a million tonnes of plastic microfibres a year contribute to ocean pollution – 16 times more than the plastic microbeads from cosmetics. [vi] Additionally, while synthetic clothing is on the rise and now accounts for around 60% of all clothing produced[vii], fewer than half (44%) of people realised that synthetic fibres such as polyester, acrylic or nylon are actually plastic. Clothes cause 1/3 of micrifiber pollution, and are the main polluters to microfibers in the ocean’s according to the Ellen McArthur foundation. They also reported that 22 million tonnes of microfibers will be dumped in the ocean from 2015 to 2025. 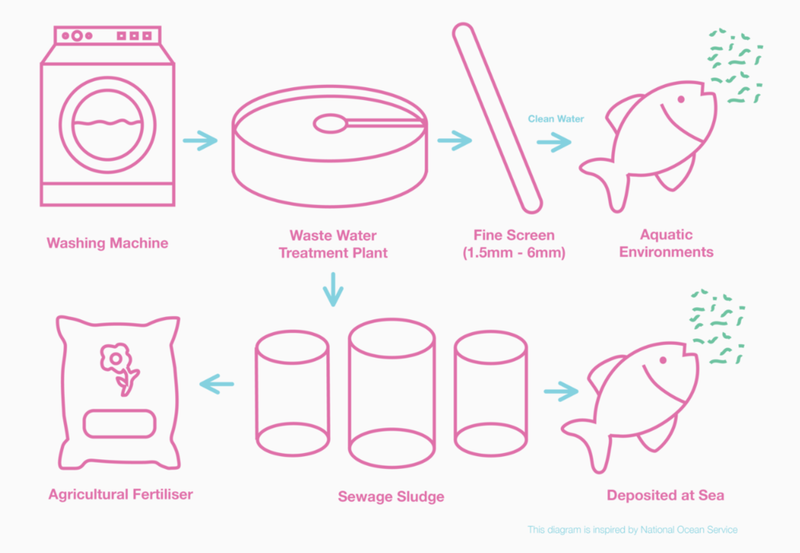 Microfibers are 5mm small, how many fibers make 22 million tonnes? As we aren’t sure of the biological effects of microfibers, I am taking creative license in saying that microfibers found in our water and food chain, and soon enough us, cannot be healthy. How Are They Getting Into the Water? Microfibers come into the water through mainly two ways. First as synthetic materials are being produced and then every subsequent wash after that. As the material rubs together in the wash, the friction breaks off tiny microfibers into the washing water and then down the drain. Depending on your water filtering system in your country, but most will go through a water filtration system which will catch 65-90% of microfibers. However as the fibers are so small a lot will get through the filter and stay in the water to end up in the oceans or in fertilizer water and used in agriculture. It can be filtered again, but the filter still cannot catch all the fine microfibers, and they can end up in our drinking water. Yum! Hubbub suggests there are a few things you can do to try to cut down on your impact and adding microfibers to the water ways! Choose clothes you really love and which are more durable, so you can get more wears from them.Synthetic clothes ending up in landfill are a growing source of secondary microplastic pollution because they gradually break down into micro sized plastic particles. Look at your clothing labels and be aware of the care instructions and what your clothes are made out of. Share a picture of your label with #WhatsInMyWash to show your support. Wash clothes only when you need to. Microfibres are released in the wash, so if you can get another wear out of something, let it air instead. Air dry your clothes. Avoid tumble dryers as they may wear your clothes out increasing the likelihood of microfibre release on the next wash. Your clothes will stay in shape for longer too!